In a previous post I talked about sushi at my school. 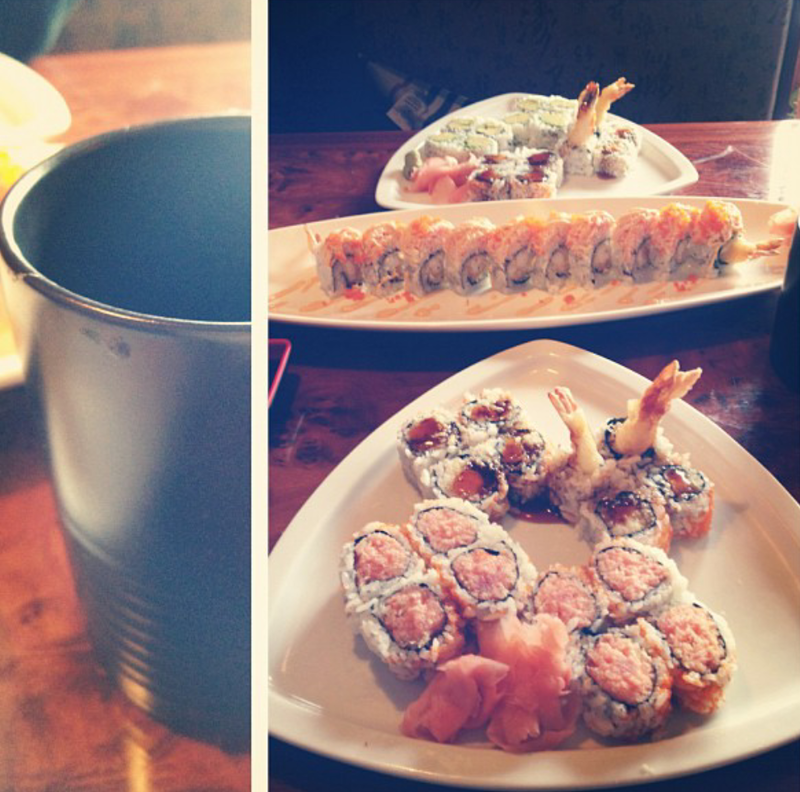 Well my friend and I had a sushi feast the other night at a local sushi restaurant. This blog is not about the sushi this time. Did you know in traditional Japanese sushi restaurants the tea is free? Yes, free. This does not mean you should demand free tea in any restaurant you go into because they are allowed to charge you. But the Japanese restaurant I waitress in at home we serve free tea. This is most likely because the owners are Asian and it is a part of their culture. Tea originally roots from China says TeaKnowledgeBase website. Tea was used for ceremonies and have continued to be used for every day use. The most famous tea is green tea is very good for the body. From about.com it says that green tea can help prevent cancer, weak immune system and cardiovascular disease. But there are also many other teas famous in Japan like jasmine tea and black tea. It is tradition for Japanese people to drink tea with their meals. More information about Japanese tea from the website Tea In Japan. Tea is very good for you. From HealthyNutrition.com it says that the tea plants have bioflavanoids which are antioxidant plant pigments. Tea is filled with vitamins and it helps your immune system. This is why whenever you are sick your parents or doctors will tell you to make yourself a warm cup of tea. On my first day back at Scranton after Fall Break, I stopped at Northern Lights. A hip coffee shop down town Scranton. A lot of students walk there to grab a hot cup of coffee and a pastry. Latte Art is created by pouring steamed milk into a espresso shot to create a design into a cup of coffee. 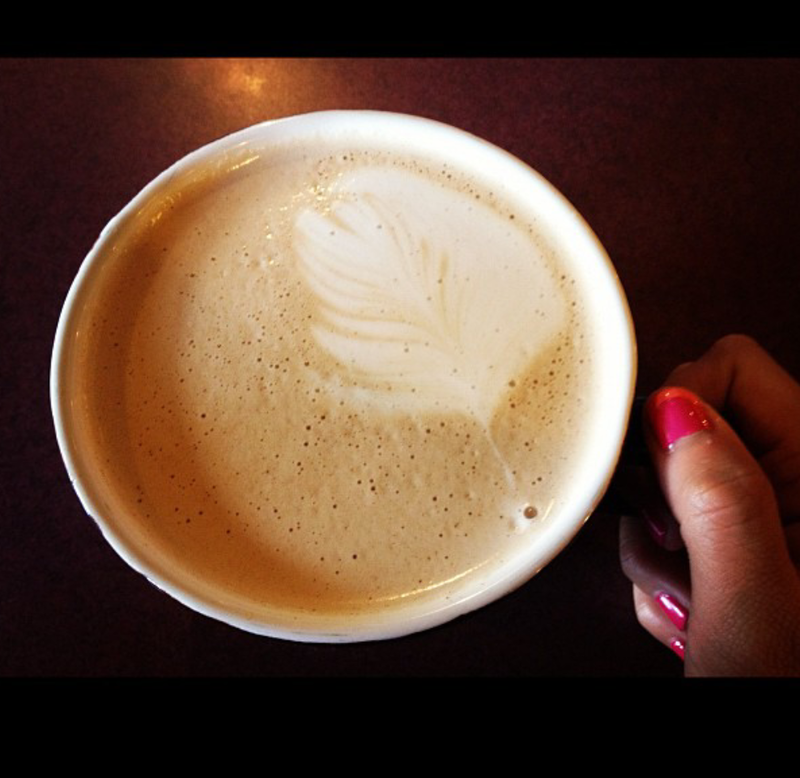 A coffee blog called SeedsCoffee, says that latte art was developed in the 1980s by a man named David Schomer. Now there are latte art competitions around the world and just local artists in your coffee shops who do it for fun. I am obsessed with coffee art! Here is a YouTube video of it in action. Here from Wiki – 3 Ways to Make Latte Art shows some simple, easy steps on how to make art out of your coffee. It seems simple but you have to have a crafty eye and it takes practice. A couple weeks ago I mentioned going to an event where a Pulitzer price winner came to speak at my school. I also mentioned my class being able to live tweet the event. Here are the tweets my classmates and I put together! My News writing communication class was honored to be invited to breakfast with the authors of “Almost Home.” Tina Kelley and Kevin Ryan are two inspiring people who shared many inspiring stories with us. Apples are the perfect healthy snack. They are also great to add to a healthy meal for flavor and texture. I see apples as an easy way to be healthy because they taste so good. “An apple a day will keep the doctor away.” This phrase is true in the sense that apples are really healthy for you. They have zero cholestoral, fat and sodium. Most apples (depending on the size) are around 80 calories. Apples have vitamin A and E and also C which helps the immune system. Apples gives the body a boost of natural energy which everyone could use. It is a very good snack when you are dieting or just trying to eat healthy. Here are 9 more reasons why apples are beneficial for the body. So put down the chips and pick up an apple. 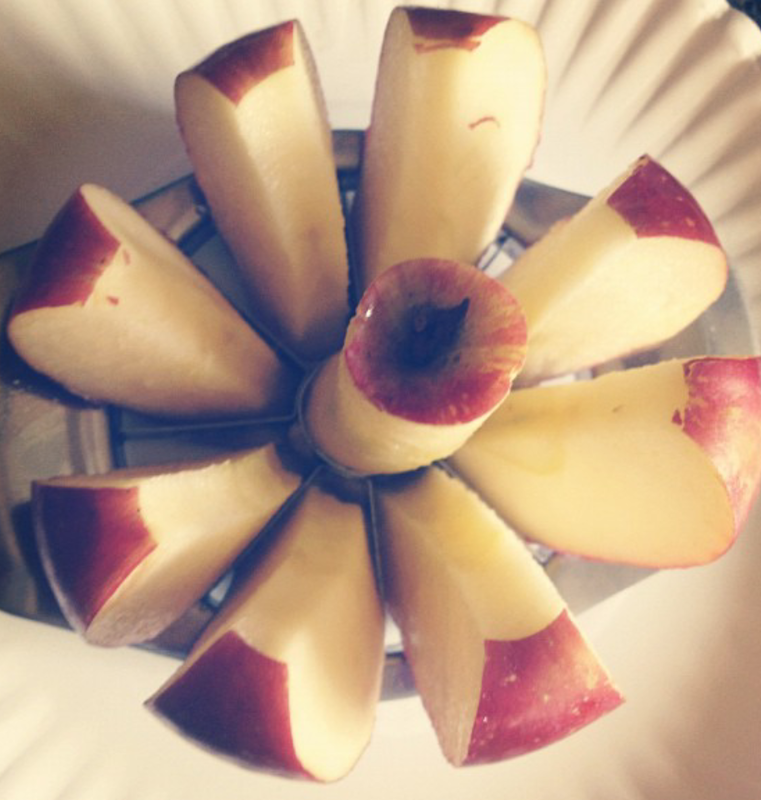 If you are not a fan of biting apples, buy an apple cutter like in my picture. It cuts the apple into 8 pieces that make it easier to eat. This also makes the apple easier to dip into other foods like peanut butter or caramel. You can buy an apple cutter from most food stores but here’s a apple cutter for only $4.49 from Fox Run. Also, Fall is the season for apple picking! Since I am in Pennsylvania, I looked up a couple of different orchards from an Pennsylvania Orchards Directory which shows exactly where different apple picking locations are. Apple picking places are easy to find. By searching on Google.com or just asking around. Enjoy your apple eating! 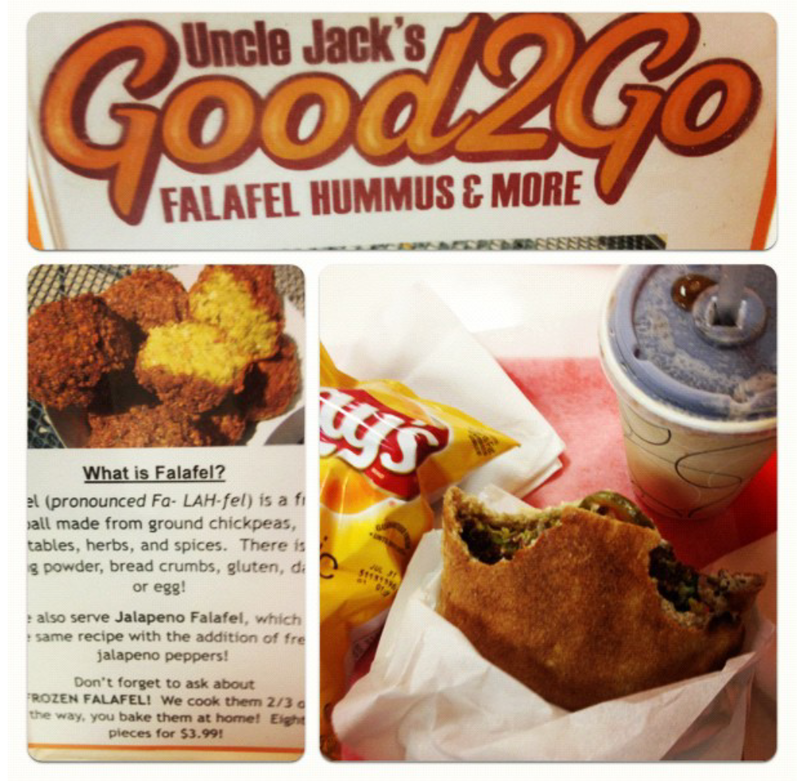 Another place I need to visit was a fast food hummus restaurant in my home town called Good2Go. They specialize in making healthy, vegetarian fast food. My favorite meal to order is the traditional falafel. It has chickpeas, hummus, veggies, and it is all stuffed into a pita pocket bread. It may not sound very filling, but one of these will fill me up for dinner and I usually can barely finish it! The falafel is a popular fast food meal in the Middle East that is making it’s way over to America. Falafels take about 15 minutes to prep but about an hour to cook. But it is worth the wait. At About.com – How to make a Falafels shows you a recipe to making a simple falafel meal. A falafel is fried chickpeas, vegetables and herbs packed into a ball. It is vegetarian friendly and also has a great taste. Chickpeas or garbanzo beans are known in the Mediterranean, India and the Middle Eastern. It is known to make falafals and a certain kind of Burmese tofu. It replaces red meat, they are high in fiber and can lower cholesterol. They are great to add to a salad to replace tofu. Like tofu the chickpea does not have a strong taste but it does fill you up. Here the website the World’s Healthiest Foods, lists chickpeas as one healthy ingredient. In my previous post, I mentioned that I had Fall Break the past few days. When I’m home I love cooking. 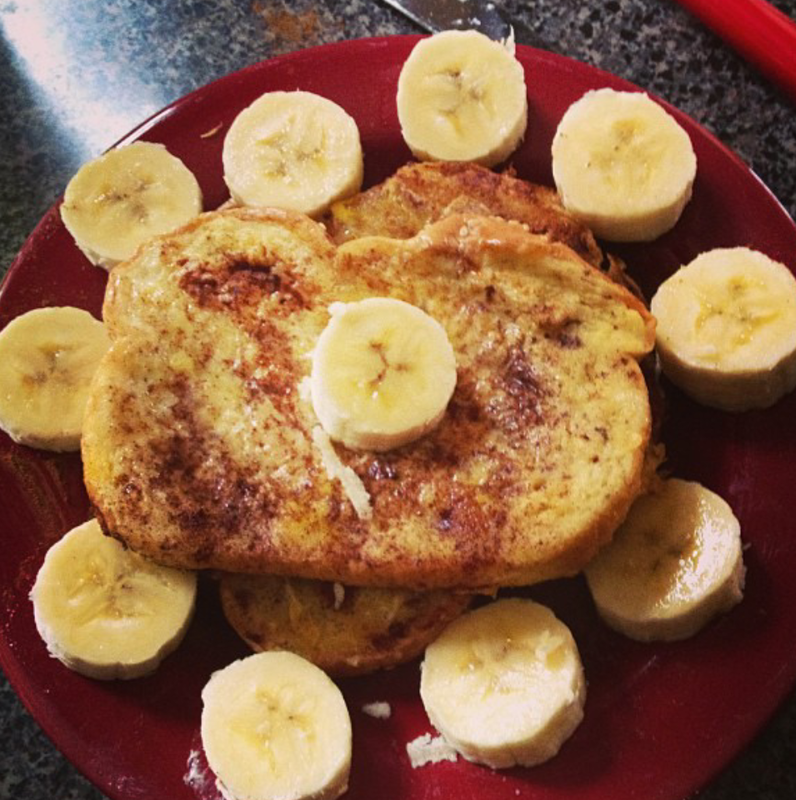 In the morning I cooked an easy breakfast, some french toast with cinnamon and bananas. It is a very tasty breakfast that combines toast and pancakes but has a unique taste. nana for some extra flavors, but blue berries and strawberries are also great to add! And there is you quick and easy meal. If you want to get more of an idea about making french toast, here is another simple french toast recipe. I like to add bananas to my breakfast because they are filled with great things for your body! They are high in fiber, are great for building energy and they are delicious. Here are 25 more reasons why you should eat bananas! I read some tips on making the best french toast from a website French Toast Secrets. One tip is using the right bread, like stale bread! 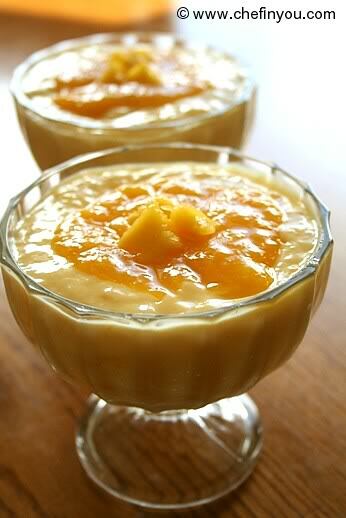 It helps soak up the mix of eggs and milk, etc. Also if you are cutting your own bread to cut thick pieces like Texas toast style. I hope this helps improve you french toast making skills. 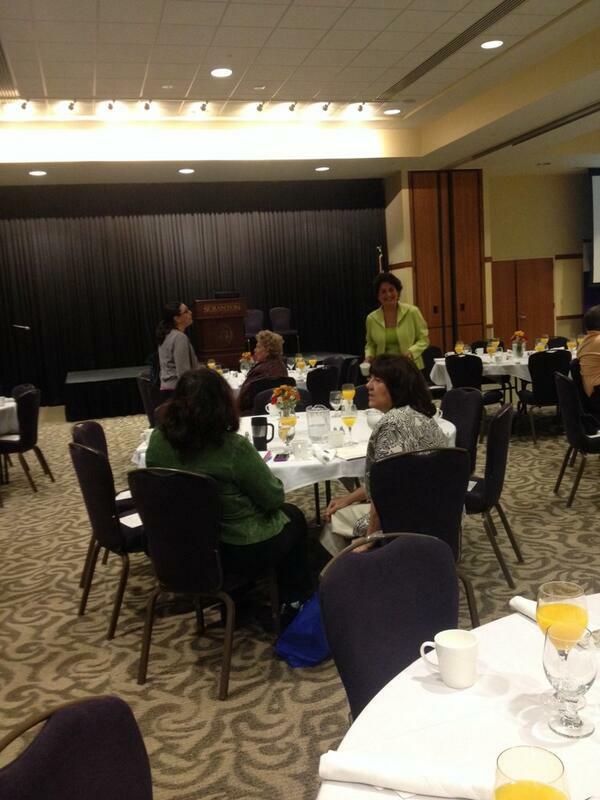 This past weekend the University had their Fall Break for the students and faculty. I went home to New Jersey. Whenever I go home there are numerous places I must go to get my comfort food. 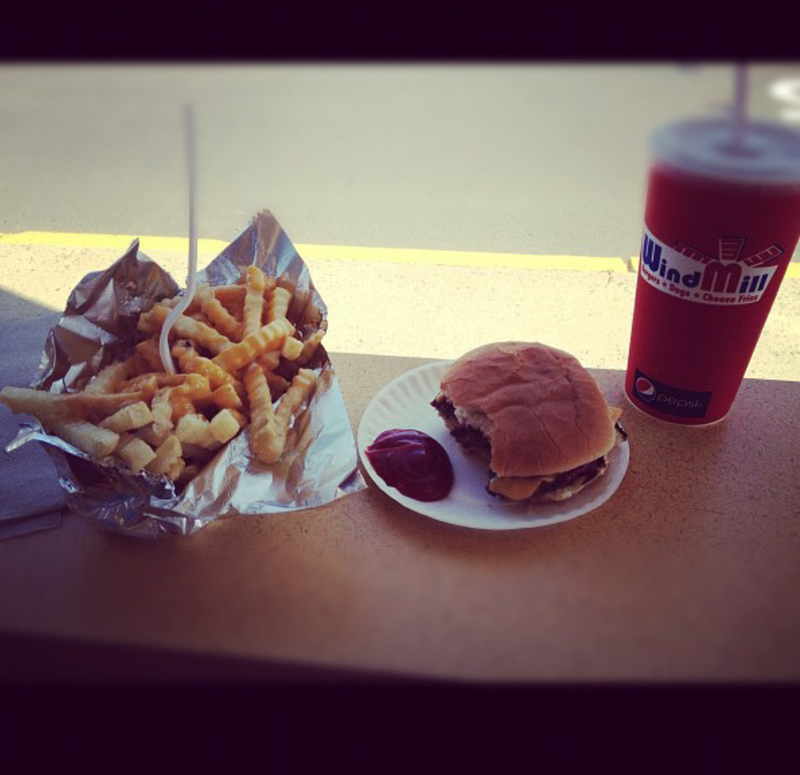 My first stop was the fast food restaurant called WindMill which is a famous burger place in New Jersey. If I’m not ordering a cheeseburger with fries, I get chicken fingers and fries with cheese sauce on top. This is a little different than the previous posts I have been writing because this food is not the healthiest. But, everyone needs some greasy foods especially when you are craving it. The WindMill’s menu includes all of Jersey’s finest beach food of burgers, hot dogs and fries. The restaurant is even located a block from the beach! I like my burgers cooked medium when the center is a slight pink and juicy. It can be difficult to cook/grill the perfect burger without under cooking or over cooking it. The best way to cook the perfect hamburger is by buying good meat. Meaning good beef that is at least 20% fat because that determines how juicy it will be. Some people like to grind there own meat but most grocery stores have it pre-grinded or will grind it for you. To get your burger to be medium it takes about 3 minutes for each side. I read on burgerology: How to cook a perfect burger, that if you are making a cheese burger to wrap your burger with aluminum foil helps melt the cheese on your burger to give it a really nice taste. And you have a delicious burger! The hamburger appeared around the 20th century said in The History of the Hamburger on Wikipedia. It was invented simply because people did not have enough time to cook a full meal, so instead they took meat and put it in between two slices of bread and that was the start of a long tradition in America. 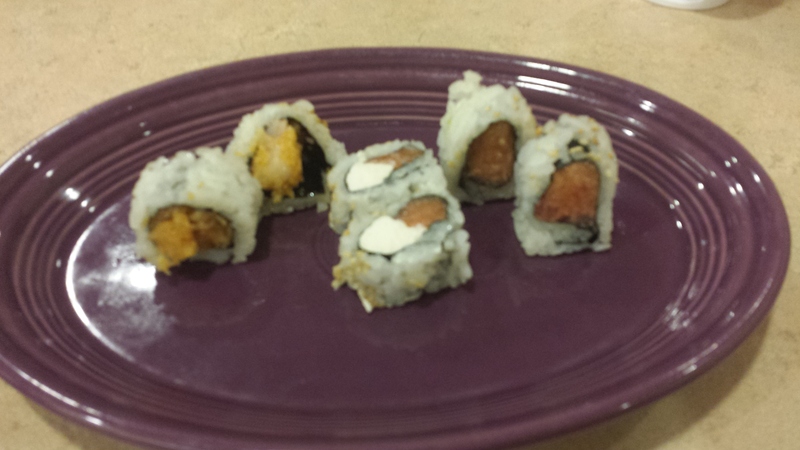 The University offers free sushi night every once and a while. This is a great way to get a large crowd at the cafeteria. I went around 6:45 p.m. and could not even find a seat! Sushi has become very popular over the past couple of years and I have participated in the sushi craze. I even learned how to make sushi at my old job. I love sushi, my favorite roll is a tie between spicy tuna and salmon avocado and I love tuna sashimi as well. Mmmm I’m hungry thinking about it. Of course the fish is raw, at first I was not a fan of this but after tasting raw fish I fell in love, well my taste bites did. Sushi is not only tasty but it has a lot of nutrients. Raw fish that is caught and prepared the freshest are the ones to eat. Fitday.com it talks about the different types of raw and their nutrients. If you are skeptical about eating raw fish here’s a blog about some signs to look for to scope out bad sushi. Men’s Health Website also has a few of the most popular rolls that people usually get and includes the calories and nutrients they have. An observation of a couple websites I’ve read now, the roll that are the least amount of calories are of course the vegetable rolls that are about 130 calories. A plain tuna roll is about 180 calories. This is not including the amount of soy sauce or ginger and wasabi added. Homemade sushi sounds tricky but the truth is it is simple. At my old waitress job, I watched the sushi chefs make sushi masterpieces on a plate in minutes. If work was slow and there were no customers I would ask the chefs to teach me how to make sushi. The fish has to be very fresh and the knife you use has to be very sharp. It is a task they have been practicing for a while but I found a couple tips on how to make homemade sushi from makemysushi.com. Meat Is Good For You Too! 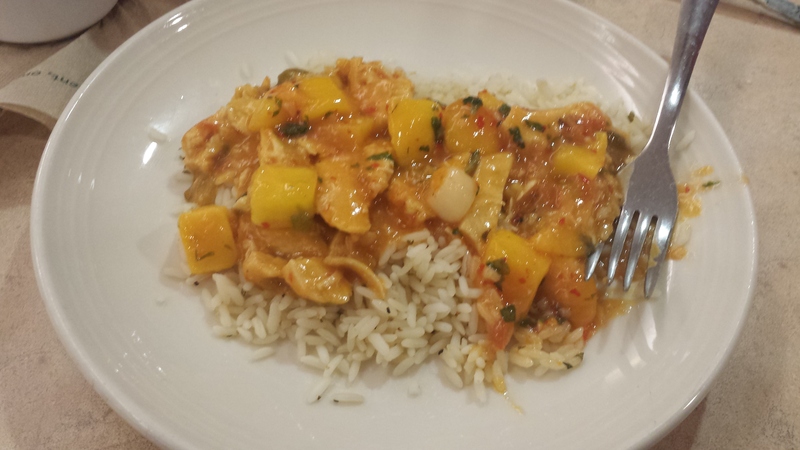 So, I broke my streak of eating non meat and I enjoyed upscale Wednesday at my school. Usually we have to pay a couple of bucks but some Wednesdays they have free upscale which is usually when I participate. 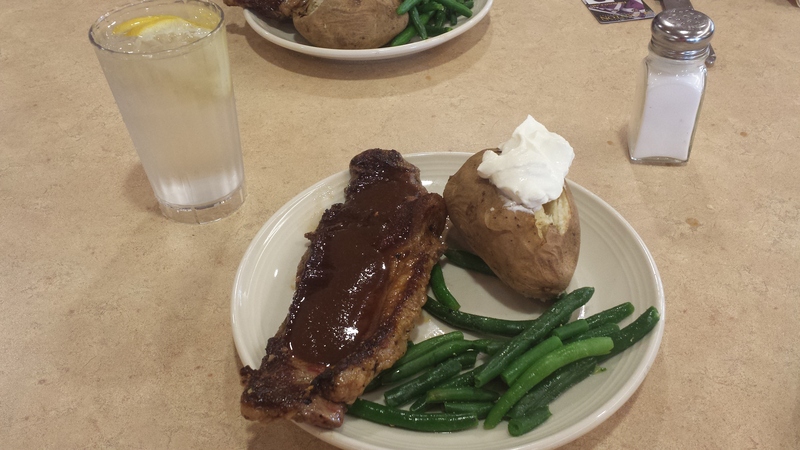 Tonight they had steak! My absolute favorite, with a baked potato and string beans. If someone asked me to describe my ideal dinner it would be what I had tonight. Steak does not have to be just slapped on a plate next to some greens and potatoes. Even it is still delicious. But you can get creative with steak! Add some greens and make a steak salad or make some steak tacos. Steak can made in many different ways and if you are not a fan of steak try pork, salmon, turkey or chicken! They all include protein but all have different tastes. For the people who work out everyday or play a sport you need the protein for you bones and for cell repairs. It helps with other things in your body like regulate your red blood cells and add to the iron you need in your body. It is all about regulation, you have to eat meat in portions and eat smart. For example, steak or a hamburger every night is not healthy for your body. It can cause high cholesterol and has high amounts of saturated fats. There are more facts about eating meat healthy from YourHealthyBody.com.